Dr. Courtney Aklin talked to the students about careers in science. 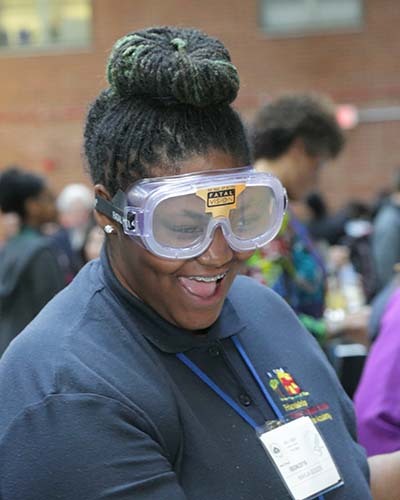 Just before the end of the school year, hundreds of middle and high school students from the Washington, DC area gathered at NIH for the National Library of Medicine’s third annual Science Pathfinders Day. Through demonstrations, hands-on activities, and speeches, students got to experience what it might be like to work in a lab, a medical office, and, of course, a medical library. 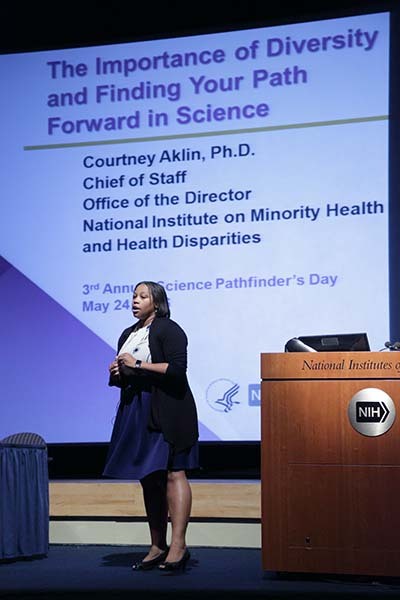 Science Pathfinders Day is an example of the National Library of Medicine’s outreach to special populations. The day was part of a partnership between the National Library of Medicine, the Friends of the National Library of Medicine, and Mentoring in Medicine, a nonprofit organization that works to inspire disadvantaged and low-income students to become health care professionals. Hands-on activities helped spotlight the diversity of science research. Strawberries were smashed to extract and isolate DNA, and marshmallows, sprinkles, and candies were mixed to visualize the components of blood. But the activities weren’t all sweet. Activities were educational and entertaining! Employees from NLM’s Toxicology Data Network created a question and answer game about the risks of common toxins. When the students answered correctly, a light bulb lit up. At the end of the day, it was a wrap. Or shall we say a rap? As a final activity, the students rapped about science for one another. More proof that even when school’s out, science is always in. ♢ To inspire and equip disadvantaged and low-income students to become health care professionals through academic enrichment, leadership development, civic engagement and mentoring programs. ♢ To engage, educate and empower students--from elementary to professional school--by providing resources, support and guidance to help them reach their true potential. ♢ To help meet the nation's health care and science needs by diversifying the biomedical workplace.